Radiofrequency ablation is a procedure in which radio waves are used to produce an electrical current that applies heat to targeted nerve tissue in order to relieve symptoms that are associated with various types of chronic pain. The manner in which the heat is applied to the affected nerves causes a semi-permanent disruption of pain signal transmission from the spinal column to the brain by impairing or completely destroying nerve tissue. This nonsurgical procedure was first discovered to be an effective method for relieving chronic pain in 1931 when it was used to treat a case of trigeminal neuralgia, which is a condition that affects nerves located in the face and causes excruciating jolts of pain. Ever since the initial successful radiofrequency ablation procedure was performed, it has become increasingly popular amongst both patients and physicians over the last fifteen years due to its documented benefits. In particular, various reports have explained that the disruption of nerve function through radiofrequency ablation has led to larger improvements in spine-related pain than conventional treatment methods. Additionally, reports suggest that pain relief is maintained for six to 12 months after radiofrequency ablation is performed. 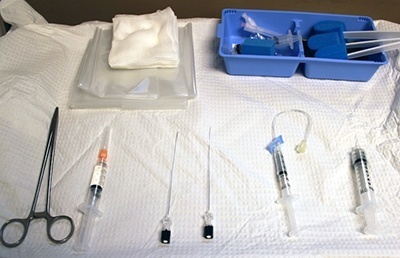 Additional benefits related to this procedure that have made it the treatment method of choice for many patients, as well as physicians, include optimal precision during needle insertion, being able to repeat the procedure if necessary, and being able to perform it in an outpatient setting. There are two basic types of radiofrequency ablation known as continuous radiofrequency and pulsed radiofrequency and both methods have been found to be effective at hindering the transmission of pain signals from specific nerves, thereby reducing or eliminating chronic pain. Furthermore, it is well documented that the heat-induced nerve damage is mainly responsible for the effectiveness of this pain treatment. However, reports have also suggested that improvements in the reported pain symptoms may also be attributed to the impact the electric field has on gene expression within neurons that are responsible for processing pain. Currently, radiofrequency ablation is commonly utilized to treat pain that originates in the facet joints. 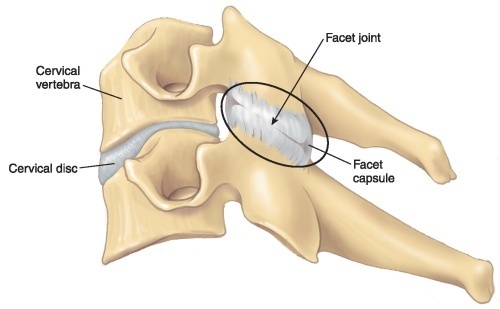 Facet joints are structures that connect the vertebrae along the spine. Networks of medial branch nerves are located within facet joints and these tiny nerves transmit pain signals to the brain when nerve tissue becomes damaged or inflamed. When the pain becomes chronic, radiofrequency ablation is often performed in order to destroy the medial branch nerves and reduce or completely alleviate the pain. However, this procedure has also been successfully utilized to treat additional conditions such as arthritis-related pain, low back pain, and cervical facet pain. In preparation for radiofrequency ablation, an anesthetic and sometimes a mild sedative are administered through an intravenous (IV) line in order reduce discomfort that may be caused by the procedure. Once the anesthetic has taken effect, the physician will begin to insert a needle into the spinal column in the region where nerves responsible for the chronic pain are located. Typically, this procedure is performed with the patient lying on the stomach, but if nerves in regions such as the neck need to be treated then the patient can lie on the back. Imaging technology such as an X-ray or fluoroscopic device is used to guide the needle to the right position and then a microelectrode is inserted through the needle. While the electrode is being positioned, a very mild electrical current is initiated that creates a tingling sensation. The physician asks the patient if the tingling can be felt and also observes both sensory and motor stimulation in the patient as this helps ensure that the electrode has been placed in the proper position. It is important that nerves responsible for pain are treated and not motor nerves, therefore, mild electrical stimulation is also utilized to ensure that large muscle groups are not being stimulated. This type of stimulation may cause minor throbbing and twitching, but this provides the physician with an indication of regions to avoid in order to prevent damage to motor nerves. After the optimal placement of the needle and electrode are confirmed, a high frequency current, which creates heat, is transmitted through the electrode into the tissue surrounding the affected nerves or directly onto an affected nerve. Before the higher current is initiated, the physician may also apply a numbing agent to the targeted nerves. Steroids are also occasionally injected in order to reduce inflammation that may already be present or could potentially develop from the procedure. No pain or discomfort should be felt from the application of the heat due to the administration of the anesthetic and the additional agents (e.g., mild sedative or steroids). The high frequency current that is used for radiofrequency ablation disrupts nerve function by interfering with the nerve’s ability to transmit pain signals to the spinal cord that would typically send sensations of pain to the brain. More specifically, the electrical current is transmitted from a generator into the electrode, the current then passes from the electrode to the body and into a grounding pad. This process creates an electromagnetic field at the end of the electrode that generates electro-thermal heat. This application of heat causes the specifically targeted nerves to become impaired or destroyed and the disruption of pain signal transmission leads to chronic pain relief. If a patient does not experience the desired level of pain relief, the ablation procedure may be repeated after two or three weeks. In general, the nerves that are damaged by radiofrequency ablation may grow back after approximately six to 18 months, but this does not automatically mean that the same level of pain that was experienced prior to the treatment will return. Furthermore, engaging in physical therapy and remaining active can enhance muscle strength and help maintain minimal levels of pain. However, if the pain does return, the ablation treatment can be repeated. 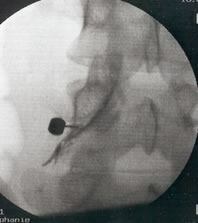 This procedure may be painful for some patients and the physician will ask the patient frequently if pain is being felt. If pain is being experienced, the position of the needle may be adjusted or more anesthetic may be administered. Furthermore, patients who begin to feel pain during the ablation procedure should immediately tell the physician. The radiofrequency ablation procedure is performed on an outpatient basis that only requires local anaesthetics although some patients are given a mild sedative so that they can feel more comfortable. Furthermore, most patients are discharged a few hours after being treated. Before the procedure begins, the physician addresses any concerns and possible complications that may occur. The patient is also asked to immediately report any pain and discomfort that is felt during the procedure as this may be a sign that nerves which were not targeted are being affected by the heat. After the procedure is complete, patients are monitored for adverse side effects such as motor deficits, muscle weakness, paralysis, or severe pain. Patients are also encouraged to have someone drive them home and to use caution when returning to normal activities as mild pain and soreness typically develops during recovery. Furthermore, damaged nerves can take up to one month to completely lose their function and during this time minor pain may still be felt. Until that time, patients may continue to experience ongoing symptoms of muscle weakness as well. In such cases, it may be necessary for the physician to prescribe oral medication that can help manage the pain and discomfort during this recovery period. There are two types of radiofrequency treatment for chronic pain known as continuous radiofrequency, which was established in 1931, and pulsed radiofrequency, which is an alternative approach that was established in the 1970s. For continuous radiofrequency ablation, the frequency of the current is gradually increased until the temperature of the electrode is between 50 to 80°C (122 to 176°F). The temperature is sustained for 80 to 90 seconds, which is the approximate time it takes for the heat to cause damage to a nerve. More than one site along a nerve is often exposed to heat to increase the probability of causing the nerve to be completely cut. As a result, the heat that is generated by the electrode disrupts the nerve’s ability to transmit pain signals. Radiofrequency ablation can take approximately one to two hours to complete depending on the position of the injection site as well as the number of nerves that need to be treated. Pulsed radiofrequency ablation is quite similar to the procedure for continuous radiofrequency ablation, but very brief 20 millisecond intervals of high voltage currents followed by silent intervals of 480 milliseconds are utilized. The alternating electric currents produce temperatures in the range of 40 and 42°C (104 to 107.8°F) and the pulsing pattern is maintained for at least 120 seconds and up to 8 minutes depending on the location and number of nerves that need to be treated. In between the high voltage pulses, the heat is able to dissipate and the targeted tissue remains below 42oC; therefore, the level of tissue damage that is achieved with the continuous radiofrequency ablation method is not achieved from the pulsing method. More specifically, the purpose of the pulsing approach is to stun the nerves as opposed to damaging or cutting the nerve through the continuous approach. According to clinical studies, alternating between brief bursts of heat and silent phases weakens the membranes of the targeted nerves, but does not cause lesions. In doing so, pulsed radiofrequency ablation causes a temporary inhibition of the nerve’s ability to transmit pain signals from the spine to the brain without causing serious nerve damage. Pulsed radiofrequency ablation also offers a few advantages in comparison to continuous radiofrequency ablation such as a lower degree of nerve injury and a reduced need for local anesthesia during the procedure. In addition, the pulsed approach causes fewer episodes of pain after the procedure, less scarring, and can be used to treat various sites or conditions that would be inappropriate for the continuous approach. For instance, neuropathic conditions such as trigeminal neuralgia develop as a result of nerve injury and therefore, performing continuous radiofrequency ablation would further damage the nerve and potentially worsen the symptoms. In such cases, it is better to block the transmission of pain signals by stunning the nerve through pulsed radiofrequency. The effects of continuous radiofrequency ablation are longer lasting than that of pulsed radiofrequency, but the pulsed approach was established in order to reduce the occurrence of side effects such as motor nerve damage, which may cause motor deficits and deafferentation pain. Deafferentation pain develops when nerves that were not targeted become injured during the ablation procedure, causing inflammation and damage that was not intended. Clinical studies have also indicated that patients have not reported any adverse side effects from pulsed radiofrequency ablation and that this method is more cost effective than the continuous approach. Risks associated with radiofrequency ablation include the possibility of permanent nerve damage and the development of an infection. If an infection occurs as a result of the procedure, hospitalization, the administration of antibiotics through an intravenous (IV) line, and even surgery may become necessary. This procedure is not appropriate for individuals who have an active infection (e.g., sinus infection or a cold), bleeding problems, blood clotting problems, or women who may be pregnant. This form of treatment is also not appropriate for individuals who weigh more than 250 pounds. Furthermore, individuals who have diabetes need to have their insulin dosage adjusted by a physician on the day of the procedure. Individuals with poorly controlled diabetes or who have heart conditions and need to take blood thinning medication such as aspirin on a daily basis have to get medical clearance from their attending physician to stop taking the medication for one week. Non-steroidal anti-inflammatory (NSAID) drugs such as ibuprofen also need to be discontinued for a minimum of 24 hours, but preferably three days, before the procedure. NSAIDs can affect the blood clotting process and not discontinuing the consumption of this type of medication prior to the radiofrequency ablation procedure can lead to serious bleeding complications. In addition, consuming corticosteroids such as cortisone, prednisone, or methylprednisolone on a regular basis can further aggravate or complicate symptoms that are being caused by nerve inflammation. Radiofrequency ablation causes minor side effects such as bruising, skin discoloration, swelling, and minor bleeding at the site of needle insertion, but this generally subsides during the first few days. Leg numbness may also be experienced, but it typically only lasts for a couple of hours and may be the result of the anesthetic. If leg numbness occurs, assistance should be provided when the patient tries to walk or move around. The electrode is placed very close to the targeted nerves and this may cause a temporary, but slight increase in pain that may extend into the limbs such as the arms or legs. The anesthetic and numbing agent that are administered are meant to reduce the amount of pain that is experienced due to the procedure. There is also the potential risk of injury to blood vessels and motor nerves that are located near the nerves being treated. Furthermore, the electric current that passes through the electrode may cause an electrical burn, but this is uncommon. Potentially serious side effects that may occur during the procedure include reactions to the medications (e.g., anesthesia or sedative) that are administered, which may lead to cardiac or respiratory problems and even seizures. However, these types of side effects are extremely rare. Additionally, mild back pain at the injection site may be felt when the anesthetic wears off. The pain normally subsides after two to three days and can be treated with ice packs on the day of the procedure and hot packs on the following days if the pain has not subsided. 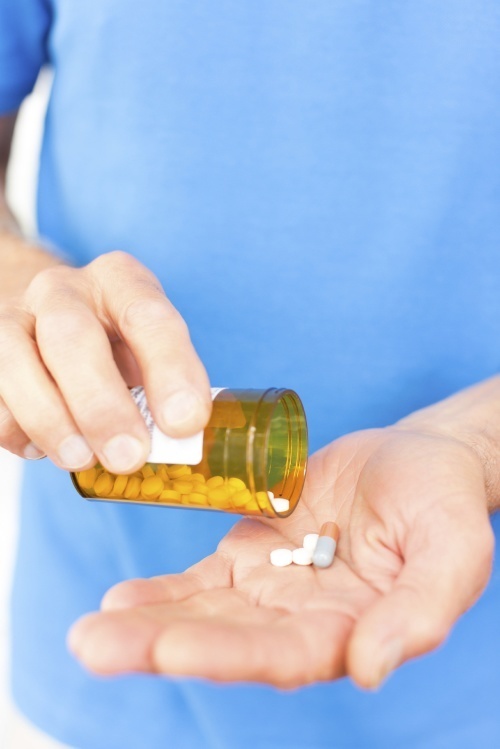 Over-the-counter pain medication may also help relieve minor back pain. In some cases, pain may be experienced or even slightly increase for one to two weeks following the procedure, but it should gradually decrease. Although the continuous radiofrequency ablation procedure causes lesions on the nerves, it may take up to one month for the treated nerves to die and during this time pain may slightly increase. However, it should not be as severe as the pain that was felt prior to the procedure. Symptoms that are experienced should be closely monitored in order to recognize the onset of harmful side effects. For instance, pain at the injection site should not be severe and if this occurs along with redness, swelling, and leg weakness or paralysis, immediate medical attention is necessary as bleeding or more serious complications may be causing the symptoms. Furthermore, fluid that drains from the injection site or a fever of 100.4 oF or more may indicate that an infection has developed. This is another complication that requires immediate medical attention. Despite the risks and side effects associated with radiofrequency ablation, it has proven to be both safe and effective at treating pain. Reports also indicate that this procedure is well-tolerated and that complications are minimal. Individuals suffering from chronic pain who have not experienced relief from conventional methods such as anti-inflammatory medication, steroid injections, epidural injections, or physical therapy may need to undergo a slightly more invasive form of treatment. A physician at a pain clinic will be able to determine if radiofrequency ablation is the right method of choice, but typically the physician will initially evaluate the length of time conventional treatments were utilized. For instance, if medication and exercise did not provide pain relief after six weeks, the physician will want to know if the patient received chiropractic or physical therapy for at least four to six months before being referred to a pain clinic. Once a patient is referred to a pain clinic for chronic pain (e.g., low back pain, facet joint pain), the condition may be treated with steroid injections for at least three months in order to determine if this form of treatment will alleviate the pain. If the steroid injections do not resolve the problem, then medial branch blocks will be performed. If the patient experiences pain relief from at least two diagnostic nerve block procedures then radiofrequency ablation will be recommended. Some patients who received steroid injections before being referred to a pain clinic may have also undergone surgery, but surgery does not always effectively alleviate chronic pain, especially in patients suffering from back pain. In such cases, radiofrequency ablation may be recommended. Radiofrequency ablation treatment only requires local anesthesia and in some cases a mild sedative, therefore it is often preferred over repeating a surgical procedure. Furthermore, surgery is associated with a higher occurrence of complications due to the general anesthesia and open surgery. However, prior to suggesting radiofrequency ablation as a method to treat chronic pain, a magnetic resonance imaging (MRI) scan or a computed tomography (CT) scan will be ordered to assess the spine. Spinal abnormalities may make the placement of the needle difficult or may deem this procedure as inappropriate. Once spinal problems have been ruled out, the physician will perform a series of medial branch blocks and assess any changes in pain that may be experienced in order to determine whether a patient may benefit from radiofrequency ablation. A medial branch block is a form of nerve block in which a needle is inserted into the spinal column at regions where affected nerve roots are located. The placement of the needle is visualized with imaging technologies (e.g., fluoroscopy, X-ray, etc.) and once proper placement is confirmed, a catheter is inserted through the needle in order to administer pain-relieving medication to nerve roots that are responsible for chronic pain. A steroid and anesthetic, or a substance that disintegrates nerve tissue is injected in order to relieve chronic pain and this treatment method leads to extended pain relief by blocking the transmission of pain signals. The effectiveness of the medial branch block provides an impression of whether or not radiofrequency ablation, which has a longer lasting effect than nerve blocks, will be successful. More importantly, the more pain relief that is experienced from repeated medial branch blocks, the greater the probability that positive outcomes will be experienced after the radiofrequency ablation procedure. Reports indicate that ablation treatment can lead to pain relief for six to 12 months and in some cases, up to 22 months. Empirical studies that initially showed the benefits of radiofrequency ablation focused on lumbar facet joint pain, as well as the removal and reduction of tumors and bone spurs. Over the years, however, ablation treatment has proven to be effective for a number of additional conditions. Reports consistently explain that patients typically undergo at least two successful medial branch blocks prior to receiving ablation treatment, which indicates that they will probably experience significant pain relief from either continuous or pulsed radiofrequency ablation. Lumbar facet joint pain and cervical facet joint pain are common conditions that may develop due to arthritis or nerve damage. The medial branch nerve is responsible for the pain sensation that is felt in the corresponding joints (e.g., back and neck) and a medial branch nerve block is a minimally invasive procedure that provides an impression of whether this region will respond well to ablation treatment. In reference to lumbar facet pain, continuous radiofrequency ablation provides a range of pain relief. More specifically, patients have reported pain relief that lasts from four months up to two years, with four to six months being the most common amount of time that relief is experienced after the procedure. Patients also stated that their physical well-being as well as their range of motion in the affected joint significantly improved approximately six months after treatment. In addition, reports have indicated that continuous radiofrequency ablation provides pain relief for similar amounts of time for cervical facet pain, with patients most commonly reporting an improvement of symptoms for six to 18 months. In contrast, when pulsed radiofrequency ablation is used to treat both lumbar and cervical facet pain, most patients report pain relief that last for approximately four months. Dorsal root ganglia inflammation, which may cause neuropathic spinal pain, has been treated successfully with pulsed radiofrequency ablation at 42o C (104 oF) for 120 seconds. After undergoing this treatment, patients have reported complete or significant pain relief at one month, moderate pain relief at three to six months, and mild pain at 12 months. The pulsed approach is more appropriate for this form of pain as it is typically caused by nerve damage and inducing more damage with the continuous method would worsen the symptoms. Failed back surgery and a herniated intervertebral disc are often common causes of low back pain and some individuals may also experience lower limb pain. Clinical reports have shown that pulsed radiofrequency ablation that was applied to the dorsal root ganglia responsible for low back pain as well as ganglia that were responsible for the limb pain lead to significant pain relief approximately one month after the procedure. In most patients the effects lasted for up to one year. The pain that develops from a herniated intervertebral disc is typically the result of increased pressure on the nerves and failed back surgery could mean that nerves were unintentionally damaged. In such cases, continuous radiofrequency ablation would not be appropriate. Reports indicate that radiofrequency ablation that is performed for low back pain is associated with a significant reduction in the severity of pain that is maintained for one to two years in most patients who undergo this procedure. Furthermore, pain relief is reported by patients as being much more significant and longer lasting than steroid injections. Some patients who were treated with back surgery also reported more extensive pain relief, a greater range of motion, an improved quality of life, a shorter recovery time, and a decreased need for pain medication after undergoing radiofrequency ablation. However, in some cases, individuals who had back surgery before undergoing radiofrequency ablation did not experience the same degree of pain relief as patients with back pain who did not have surgery before the ablation procedure. This indicates that surgery may occasionally cause nerve damage that hinders the effectiveness of radiofrequency ablation. For instance, when nerves that were not targeted during treatment become damaged, such as motor nerves, deafferentation pain may develop and cause a patient’s symptoms to become worse. If this happens, although nerves in the back that may be responsible for pain may be blocked through continuous radiofrequency or stunned through pulsed radiofrequency, the pain that the surgical procedure caused will not improve. Trigeminal neuralgia is a condition where the trigeminal nerve, which is responsible for the perception of touch and pain in the face, eyes, nose, and mouth, becomes affected. Currently, it is believed that multiple sclerosis or pressure on the nerve from a tumor or swollen blood vessel are the most common causes of this condition. It is characterized by excruciating pain that occurs during normal activities such as chewing, drinking, eating, brushing the teeth, shaving, or putting on makeup. Trigeminal neuralgia is typically treated with medications, glycerol injections, or surgery, but to date, radiofrequency ablation appears to provide the longest periods of pain relief. For instance, medication such as anti-seizure drugs, muscle relaxants, and antidepressants may be prescribed, but this form of treatment only reduces the occurrence and degree of pain instead of permanently alleviating the symptoms. Glycerol injections block pain signal transmission by damaging the trigeminal nerve, but patients have reported the recurrence of pain from this form of treatment as well as facial numbness and tingling. Surgical treatment involves destroying or cutting a section of the trigeminal nerve, but this poses the risk of causing motor deficits. Interestingly, a number of patients suffering from this condition who have been treated with pulsed radiofrequency ablation have reported an improvement in symptoms that lasted between ten to 22 months. These clinical studies indicate that simply stunning the nerves in the face and disrupting their membranes through the pulsed approach is sufficient enough to provide long-lasting pain relief. The pulsed method typically only provides approximately four months of pain relief for individuals suffering from lumbar and cervical facet pain so in such cases, continuous radiofrequency ablation is the preferred method of choice despite the risks. However, damaging motor nerves in the face could lead to serious complications so the ability of the pulsed method to provide long-term pain relief for individuals with trigeminal neuralgia makes this approach especially beneficial toward the treatment of this condition. The sphenopalatine ganglia are a network of nerves that provide pain and touch sensations to the face and head region. When these nerves become inflamed or irritated, an individual may experience chronic headaches and facial muscle pain. Similar to the trigeminal nerve, damage to nerves in this region can lead to motor deficits or even paralysis, therefore it is better to avoid continuous radiofrequency ablation. However, reports indicate that utilizing pulsed radiofrequency ablation to treat chronic headaches and conditions that may be causing atypical facial pain provide most patients with up to one year of mild to moderate pain relief, and in some cases, complete pain relief. Patients have also reported a reduced need for oral opioids and the absence of complications such as bleeding, infection, swelling, numbness, and fluid retention around the injection site. These types of clinical studies indicate that the pulsed approach is both safe and effective for treating nerve pain in sensitive regions such as the head and face. Overall, the degree of pain relief that is experienced by individuals who undergo radiofrequency ablation is dependent upon the cause of the pain, the location where the pain is being felt, and the number of nerves that need to be treated. After a continuous radiofrequency ablation is performed, moderate to complete pain relief typically occurs after the nerves have completely lost function which can take anywhere from two weeks to one month. The effects from this approach are often sustained for six to 12 months. In opposition to the continuous approach, the pulsed radiofrequency ablation procedure stuns nerves and slightly weakens their membranes, and some patients have reported immediate pain relief after this procedure. Furthermore, some individuals experience pain relief for up to two years after undergoing radiofrequency ablation. Radiofrequency ablation is a minimally invasive procedure that has been deemed as one of the most precise pain management treatments that are currently available. This procedure involves the semi-permanent destruction of nerves that are responsible for chronic pain through the use of an electrical current that creates heat in the region where inflamed nerves are located. The heat causes lesions along the nerve that leads to a loss of nerve function and the disruption of pain signal transmission from the spinal cord to the brain. As a result, patients experience significant reductions in pain after undergoing this procedure. This treatment method was initially found to be beneficial for trigeminal neuralgia and lumbar facet pain, but it is now widely used to treat arthritis-related pain, low back pain, and cervical facet pain. Patients have also reported shorter recovery times, improvements in quality of life, improved range of motion, and a reduced need to take pain medication in comparison to other treatment methods such as physical therapy, steroid injections, or surgery. There are two basic types of radiofrequency ablation known as continuous radiofrequency and pulsed radiofrequency. 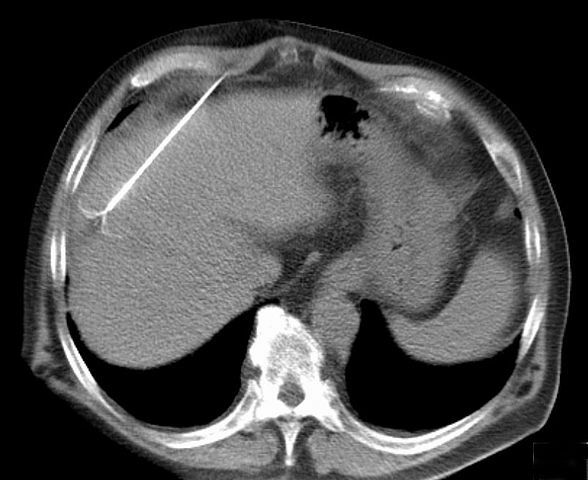 Continuous radiofrequency ablation is the more commonly utilized method that has long-term pain relieving effects that can last up to two years in some cases; however, when nerves are continuously exposed to the heat that is generated by the electric current, the risk of complications increases. As a result, pulsed radiofrequency ablation was established as an alternative treatment method in order to avoid serious side effects and complications such as damage to motor nerves, deafferenation pain, and excessive scarring. The pain relieving effects of the pulsed approach typically last for up to four months, but this method requires less anesthesia and is less invasive than the continuous approach so it can be performed more often if necessary. Prior to determining whether or not radiofrequency ablation should be performed, a physician will require that a patient undergo at least two successful medial branch blocks as this procedure indicates how effective an ablation procedure may be. A physician will also assess the location of the chronic pain as well as the nerves that may be responsible for the pain in order to decide whether it may be better to perform continuous radiofrequency ablation or pulsed radiofrequency ablation. Currently both of the radiofrequency ablation procedures are still being optimized depending on the condition being treated. As this procedure is further improved upon, physicians may be able to treat a larger number of conditions, the length of pain relief that individuals experience may increase, and the occurrence of side effects and complications will continue to decrease. Choi R, Atlas SJ, Stanos SP, Rosenquist RW. Nonsurgical interventional therapies for low back pain: A review of the evidence for an American Pain Society Clinical Practice Guideline. Spine. 2009;34(10):1078-1093. Shabat S, Leitner J, Folman Y. Pulsed radiofrequency for the suprascapular nerve for patients with chronic headache. J Neurosurg Anesthesiol. 2013;25(3):340-343.